Energy Savers includes a list of tips to help you save energy and money. This section of our web site will be updated regularly with input from REA members and will be focused on providing you information on energy-saving ideas. Technological advances in energy-efficient products can help our members save a lot of money. Today, you can choose refrigerators that use the same amount of power as a 75-watt light bulb, high efficiency light bulbs that last longer and require less electricity than traditional ones, and energy-efficient windows that can keep hot and cold air in and prevent hard-earned dollars from escaping. Over the long term, one of our goals will be to introduce you to new technologies, tips and ideas to help improve the efficiency of your homes and buildings. Statistics from an energy efficient household show that it is possible to reduce spending and save upwards of 30% per year. 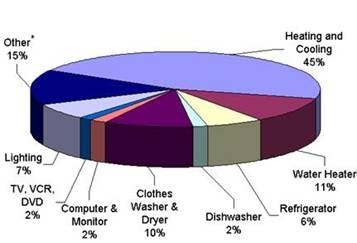 What does your energy bill pay for? * - "Other" represents an array of household products including stoves, ovens, microwaves, and small appliances. Individually, these products account for about 2% of an average household's energy bill. In the short term, there are simple, inexpensive steps that you can do today to reduce their heating and cooling costs. We hope you will find this information helpful in making energy choices that are right for you and your family. Consider doing a "Do-it-Yourself Home Energy Audit". Click here for more information on Audits. Click here for Information and ideas that will help you understand Energy and possibly reduce your energy consumption! The Niton REA was founded in June 1956 by a group of farmers looking to bring power to this area. They contracted Calgary Power to install the poles and wires in order to provide power at a reasonable cost and your REA strives to maintain that level of service today with six local directors and an administrative assistant. Keeping members informed; providing information on Deregulation, New RRO Rates, Distribution Charges, REA Services and Outage Information. Our current RRO Rate is 8.000 cents per kWh.